Section 101 (1) of Companies Act, 2013 provides that a general meeting may be called by giving at least 21 clear days’ notice in writing or through electronic mode in such manner as may be prescribed. ‘Electronic means’ includes any communication sent by a company through its authorized and secured computer programme. Capable of producing confirmation and keeping a record of the particular communication addressed to the person entitled to receive such communication at the last electronic mail address provided by the Member. Further according to Rule 18(3)(iii) of the Companies (Management and Administration) Rules, 2014 if the notice is sent in form of a non-editable attachment to e-mail, such attachment should be in the Portable Document Format (PDF) or in a non-editable format together with a ‘link of instructions’ for receipt of downloading relevant version of the software. The company shall ensure that it uses a system which produces confirmation of the total number of recipients e-mailed and a record of each recipient to whom the Notice has been sent. The copy of such record and any Notices of any failed transmissions and subsequent re-sending shall be retained by or on behalf of the company as ‘‘proof of sending’’. In cases where the Notice is sent by e-mail or any other electronic means, the proof of sending of the Notice is required to be maintained by the company. Proof of sending of the Notice should be preserved for such period, as may be decided by the Board. In case any legal proceedings in connection with the same are pending, this proof should be maintained till complete disposal of the proceedings, including accounting for limitation period for any appeals. The proof may be maintained in soft form. Rule 18(3)(i) of the Companies (Management and Administration) Rules, 2014 provides that in case the Notice and accompanying documents are given by e-mail, these shall be sent at the Members’ e-mail addresses. The email will be sent on the registered with the company or provided by the depository, in the manner prescribed under the Act. A company is required to provide an advance opportunity at least once in a financial year. To the Member to register his email address or to update a fresh email id with the company or get such details updated with the depository. 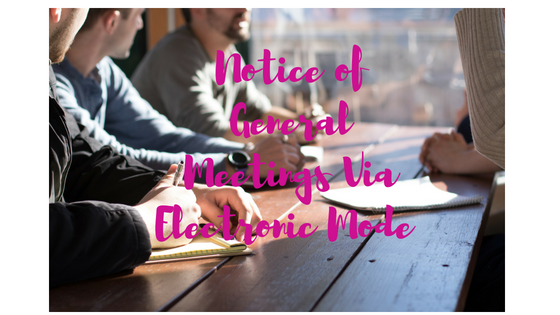 Notice of the General Meeting should contain a Note in this regard. If a Member does not provide an updated e-mail address. The company shall not be in default for non-receipt of such Notice by the Member. In case of the Directors, Auditors, Secretarial Auditors, and others, if any, the Notice and accompanying documents shall be sent at the e-mail addresses provided by them to the company. If being sent by electronic means. You can also visit our company registration online or register for any assistance of Private Limited Company Registration.